Here's our quick guide to arriving on site and what to do and when to do it. Check in at reception (remember to take your booking confirmation form or letter to speed things up) then follow directions to your pitch. 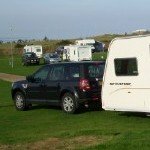 On most caravan parks you will have to reverse the caravan on to the pitch, unless you have a pitch in the middle of the park so you can drive on forwards. You should be able to see by the slope of your pitch if you are going to need any levelling ramps, bricks, blocks etc. The site warden should be able to help if you need to borrow some bricks or blocks but please remember to return them at the end of your stay. Before uncoupling the car, use a spirit level to check if the caravan is level from side to side. If not level, place a levelling ramp, or suitable blocks of wood under the lower side wheel and use the car to slowly pull the caravan onto it. When level, pull on the handbrake and use wheel chocks to keep the caravan static. Unplug the 12v electric and safety breakaway cable. Raise the jockey wheel to approximate level. Then use a spirit level front to back on the caravan floor and adjust the height of the jockey wheel until the caravan is completely level. Lower the corner steadies, using feet, blocks of wood or bricks if the ground is soft. Connect the mains cable to the socket on the caravan and the electic point for your pitch. Switch on the mains in the caravan and check if the lights work. Turn on the gas cylinder if you are using gas otherwise we would recommend leaving the gas turned off. Switch fridge to mains if electric hook up is being used. Fill up the water containers and connect to the caravan. Turn on the water heater if you are going to need hot water. Set up waste pipes and waste container. Fill up the cassette toilet flush tank with water and chemicals. That's our quick guide to arriving on site and setting up your caravan - You now should be ready to put the kettle on and sit down for a well earned rest (unless, of course, you have an awning to put up!). Do you have any tips for arriving on site which would be useful to other caravanners? Click here to let us know.